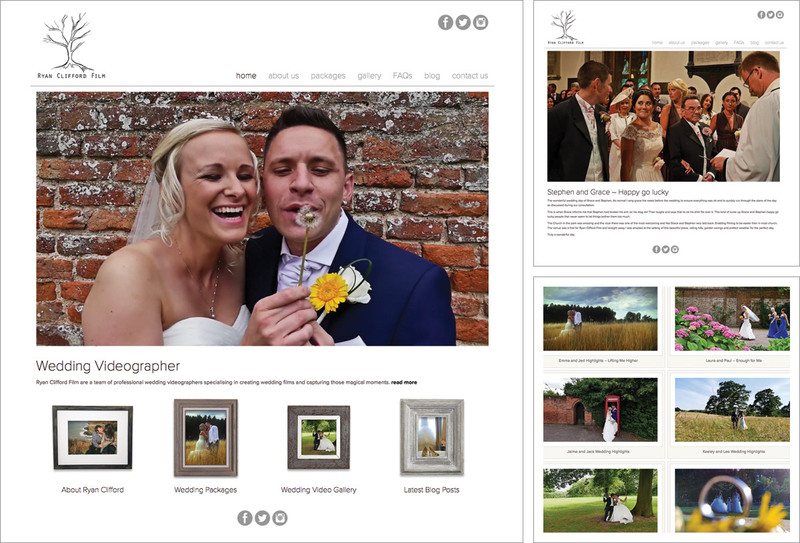 Wedding Videographer Ryan Clifford has created an elegant, scrapbook, weddingy, vintage feel website to complement his exquisite highlight films and documentary style wedding videos. This website has a real personal touch and Ryan used the creative vision which is so apparent in his film making to direct and produce a blockbuster website. This mobile friendly website responds according to the type of device being used to access it and the layout and content automatically adjust to give the viewer the best possible experience and navigation options. High definition videos are embedded within the website using Vimeo, presenting a video still and options to play, pause, forward etc. New video content may be added at any time as the site is completely expandable and the website also features a blog which Ryan can update himself. The gallery has a selection of wedding highlight films to show Ryan’s expertise in capturing the very essence of the day, the emotion, the moments, the happiness.